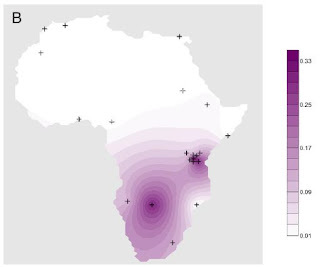 First, it reports the discovery of a new major clade within the Y-chromosome phylogeny which unites many previously paraphyletic E-M35* chromosomes, and charts its distribution in Africa (left). Using the same mutation rate described in Fig. 1, we estimated a maximum age of 2,700 ya (ρ=0.6, n = 10) with a standard error (SE) of 1,100 y. A major unresolved question is: were early instances of sheep, cows, pottery, and their pastoralist markers transmitted to southern-central Africa by demic or cultural diffusion? But, this claim is another house of cards based on an assumption of an evolutionary mutation rate that is much lower than the observed germline rate. The authors cite Zhivotovsky et al. (2004) (pdf) regarding this rate, but Zhivotovsky, Underhill, and Feldman (2006) showed that such a lower effective rate is observed in a constant-sized population, where each lineage grows stochastically according to a Poisson process with parameter 1. The expected number of its descendants after g generations is 0.5g or 40 individuals after 2,000 years, a few orders of magnitude less than the real number of E-M293 bearers. So, the evolutionary rate is totally inappropriate for the pastoralist groups in question who have grown to a much larger size than that. For a more thorough discussion of the problems with the evolutionary rate, see my two part discussion (part I and part II). In a group that expands in size a much faster evolutionary rate is appropriate, approaching the germline rate. The argument that E-M293 is associated with the introduction of pastoralism to southern Africa is another house of cards resting on the assumption of the slow evolutionary mutation rate. So, while E-M293 did follow the proposed migration route, and E-M293 migrants were also pastoralists, they weren't necessarily the people who introduced pastoralism to southern Africa -- they came much later. Related public release and blog post at the Spittoon. Although geneticists have extensively debated the mode by which agriculture diffused from the Near East to Europe, they have not directly examined similar agropastoral diffusions in Africa. It is unclear, for example, whether early instances of sheep, cows, pottery, and other traits of the pastoralist package were transmitted to southern Africa by demic or cultural diffusion. Here, we report a newly discovered Y-chromosome-specific polymorphism that defines haplogroup E3b1f-M293. This polymorphism reveals the monophyletic relationship of the majority of haplotypes of a previously paraphyletic clade, E3b1-M35*, that is widespread in Africa and southern Europe. To elucidate the history of the E3b1f haplogroup, we analyzed this haplogroup in 13 populations from southern and eastern Africa. The geographic distribution of the E3b1f haplogroup, in association with the microsatellite diversity estimates for populations, is consistent with an expansion through Tanzania to southern-central Africa. The data suggest this dispersal was independent of the migration of Bantu-speaking peoples along a similar route. Instead, the phylogeography and microsatellite diversity of the E3b1f lineage correlate with the arrival of the pastoralist economy in southern Africa. Our Y-chromosomal evidence supports a demic diffusion model of pastoralism from eastern to southern Africa ≈2,000 years ago. I understand they do not propose that pastoralism was introduced in Southern Africa by massive migration but mostly by difussion, though a handful of immigrants would have arrived too with the cultural items they spread. Remember that pastoralism was a Hotentote (Khoi) occupation at the time of Dutch and Bantu arrivals in South Africa. Would it have been a Bantu influence, one wonders why farming (primary Bantu occupation) was not introduced with it. "Would it have been a Bantu influence, one wonders why farming (primary Bantu occupation) was not introduced with it." The Bantu came later into the Cape region, but pastoralist likely migrate over a larger area than farmers, especially in times of poor rain fall. Farmers often just try to wait it out, but pastoralist will move even further away...so it is likely they made contact first. Hmmm. What this genetic finding suggests is that it was a previous, non-Bantu input wich introduced pastoralism among the Khoi. The connection certainly seems much stronger with the Tanzanian-Kenyan Nilotic tribes than with the Bantu peoples of Middle Africa. The Khoikhoi themselves seem original from Botswana, directly linking with the second cluster of this clade in Western Zambia. It would be interesting to sample traditionally pastoralist ethnicities like the Herero and Himba, who are nowadays Bantu-speakers but might have (my speculation) an East African connection too. "So, the evolutionary rate is totally inappropriate for the pastoralist groups in question who have grown to a much larger size than that". Although there may be some genes on a particular Y-chromosome that give individuals with it an evolutionary advantage it is also possible that selection for particualer Y-chromosomes is independent of the genes on that chromosome. Selection may be a result simply of male-mediated gene flow. I think it's fair to assume that historically technology has usually been passed from father (or at least close male relations) to son. In the case in question here herding may have been carried out by male members of the community, thus leading to selection of the male line with that technology through population growth. This could account for the much higher percentage of the Y-chromosome haplotype in the relevant pastoralist groups than could be explained simply by drift. Founder effect, my friend. Neither mere drift nor selection. Selection may be a result simply of male-mediated gene flow. I think it's fair to assume that historically technology has usually been passed from father (or at least close male relations) to son. I may agree for the particular case of pastoralism, more appropiate for men than women maybe. But other techs may have passed from mother to daughter or just indiscriminately from parents to children of either gender. Funny the map also seems to mirror the "Click Languages"... especially since the Sandawe language of Tanzania (East Africa), is one of the few outside of South Africa. "But other techs may have passed from mother to daughter or just indiscriminately from parents to children of either gender". True. But I believe it is easy to under-estimate the importance of the transfer of technology and culture to offspring. Improved spears, hunting techniques, boating, pottery probably all provided an evolutionary advantage for those individuals with them and probably also are associated with the expansion of and selection for particular Y-chromosome and mtDNA haplogroups.